In the world of polymer clay, we have a running joke about being addicted to our tools. We love to get a new tool or gadget and then see what we can make using it. A fun little tool that’s relatively new on the market is something called Stampies. Stampies are small plastic tools with a hard plastic shape on the end of a square handle that are used to make impressions in polymer clay, fondant, porcelain clay, and cold porcelain. Each stamp can be bought singly or in sets. The sets come in themes. A full set has 5 stamp handles, with a stamp on each end, giving you 10 designs. Stampies are made in the UK with a 3-D printer by Mitch Pagden and his brother. Yes, these are actually printed one by one on a machine. If you look closely, you can see the ridge lines that the printer leaves behind. The stamps themselves are a hard ABS plastic with very clear designs. The designs are 3/16″ (4mm) deep, so they’re deeper than more traditional rubber stamps. The handles that hold the stamps are also printed. Each double-ended Stampie tool is 1.5″ (39mm) long and the design stamp itself is on a base that’s just under 1/2″ (11mm) square. When Stampies are bought by the set, they’re sent in these really neat little black boxes with cushy padding, an information leaflet, and two little pointed cotton swabs for cleaning out clay. I didn’t have any trouble with clay sticking, by the way. Stampies sets come in a nice box with velvet padding and two neat little pointed swabs for cleaning the stamps. I think Stampies are one of those tools that is going to have a different use for each person. The Smooth Geometry set has stars and other simple polygons that would be really neat for making random impressions around the top of a box or on a picture frame. 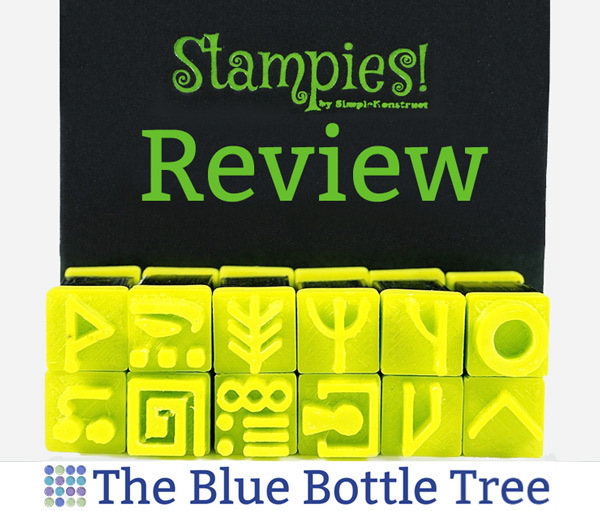 Stampies are a good source for unique shapes that are not available in other lines of rubber or acrylic stamps. Ruth Steiner took one look at the “Pillars of Creation” Stampies set and immediately set out making mokume gane. It works perfectly with Souffle polymer clay. I took the Stampies set to a recent retreat with the Central Oklahoma Polymer Clay Guild and asked people to try them out. Ruth Steiner took them to her table and came back a few minutes later with some really nice mokume gane samples (above). I agree with Ruth. Stampies are perfect for using with the mokume gane technique. Because the stamps are deep and clear, you can create some really unique impressions. Do make sure you wet your Stampies before pushing them into polymer clay. I never did have trouble with clay getting stuck in them, but do use a release just in case. Here are some mokume gane pieces that I made with Stampies on Premo polymer clay. Ruth also experimented with using the Stampies as a stamp. Here they are used to stamp mica powder onto polymer clay. (That’s Souffle, by the way. Look at that nice sueded finish.) You could also use them the same way to stamp with acrylic paint. 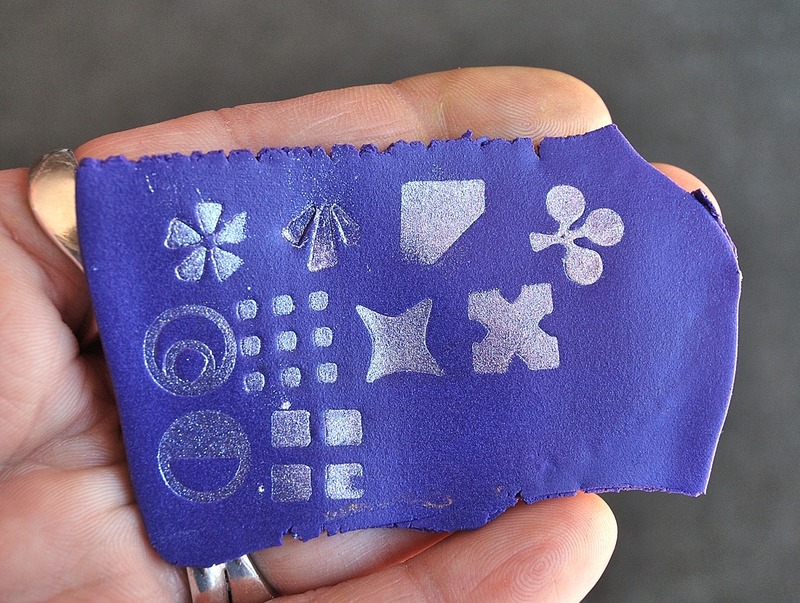 Ruth Steiner did a quick little test to see how Stampies worked to stamp mica powder onto polymer clay. You could stamp acrylic paint in just the same way. 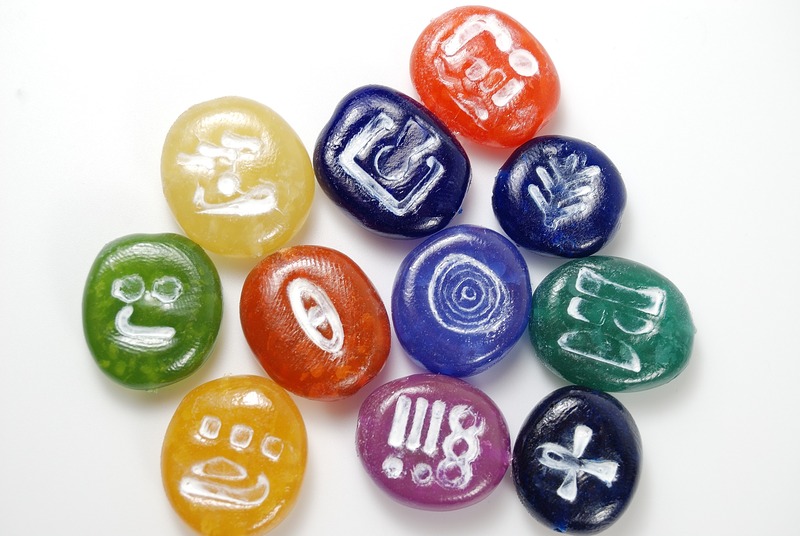 I found that you can also use the stamps within a set to create impressions into bead. The Valhalla Stampies set was perfect for creating these “rune stone” beads. I liked those so much that I tried the same idea with colored translucent to make these neat colored beads. They remind me of juicy gummy candies or maybe even faux Czech glass beads. These were made using the Ancient Origins stamp set. I didn’t have trouble with polymer clay sticking to the Stampies stamps because I did use water as a release. But if this happens to you, just use the little pointed swabs that come with the kit to pick out any stuck bits of clay. You can also clean them with a toothbrush and rubbing (isopropyl) alcohol. Do not use acetone to clean Stampies stamps. There is a Christmas-themed set of Stampies called Egg Nog. Clean designs, perfect for mokume gane. Nice size, not too big or too small, easy to use repeatedly to create a larger design. Beautiful packaging, easy to store in a small studio. Available singly or in very creative sets for a reasonable price. There are 10 sets of designs available, each with 10 stamps. That’s 100 different stamp designs. A custom design service is available to create custom stamps for your logo, maker’s mark, or to press into dragon bottoms like a tattoo. Some designs have a bit of excess material from the printing process. Might need to adjust printer settings. Designs are thick and tend to distort the clay as the press down into it. I’d like to see thinner lines in some stamps of the same basic concept. The labels on each stamp are made of paper, which tears off. I would like to see the name printed into the handle. Designs are very graphic. I would like to see more filigree styles, more organic shapes. There’s no way to tell which way a rune or symbol should be oriented. For some designs, it does matter. The meanings of the runes and symbols are not included, though information about the runes are mentioned in the Etsy shop. On a few of the stamps, there was some excess material remaining from the printing process. You can buy Stampies singly or in sets from the Simple Konstruct Etsy shop. Single stamps are $1.93 (£1.30) and sets of 10 are $17.93 (£11.99). Shipping is quite reasonable and there is a free shipping offer (even internationally), with sales over $29 (£20). There is also a Simple Konstruct website, where you can order Stampies and learn more about Mitch Pagden’s books about “The Dragons of Fyremantle”. It looks like an adorable book series perfect for dragon lovers everywhere. What Would YOU Do with Stampies? Have you used Stampies? How would you use them? Share your ideas in the comments below. Ginger, love the deep imprints and your impressive mokame gane results. Sigh, these go on my list of future purchases, after the JoolTool, blah, blah, blah….ROFL. I blame you and Cindy Lietz (at polymerclaytutor.com) for my clay addiction. My retirement might be restricted financially, but it will sure be super fun with all the stuff I have accumulated to experiment with…. Hi Ginger, I looked at the stampies shortly after Cindy Leitz produced a short video demo on them. I was not too impressed with the designs they were printing and like you, wanted to see more PC related designs. I could not justify the cost. I will say the Mokume Gane design turned out very nice. The only drawback I see with the 3D printed tools is that they do not have a thin edge and when pressed into the clay does not produce a smooth cut or impression. This was one of the problems with the Big Daddio cutters and a lot of clayers won’t use them including myself. Many clayers were having to sand down the edges to get a smooth cut. 3D printing is great for some applications but to me I would prefer a good metal cutter or stamps made specifically for PC. Kor Tools makes some nice stamps for PC, but they are so small some of them are hard to see. If Kor Tools made their stamps the size of the 3D stampies, that would be a great stamp.